Rather belatedly, details have only just been sent to the blog about another blue plaque to honour a Dams Raid participant. This is the work of the Hildenborough Historical Society and it will be installed on the house in Riding Lane, Hildenborough, Kent, in which Brian Goodale lived with his family between 1919 and 1939. The plaque will be unveiled on Thursday 17 May, the anniversary of the raid, at 4pm. On the night of the Dams Raid, Brian Goodale was the wireless operator in David Shannon’s aircraft, AJ-L. He had completed a full tour of operations in 51 Squadron and was working on instructional duties at the time he was posted to Shannon’s crew. He was a late recruit to the crew, and undertook his first training flight with his new skipper on 24 April 1943. David Shannon’s crew was only finalised three weeks before the Dams Raid with the arrival at Scampton on 20 April 1943 of wireless operator Brian Goodale. The crew’s members came from quite disparate backgrounds but nevertheless they worked well together and became an important part of the backbone of the squadron. Dedicated fighters in the air, they were serious revellers on the ground, and thereby added greatly to squadron morale. Goodale, tall and thin with a slight bent and thus known widely by his nickname ‘Concave’, was described by his colleague Len Sumpter as being ‘a bit of a character with a drink in his hand’. Goodale was born on in Kent on 12 June 1919 and joined the RAF at the outbreak of war. 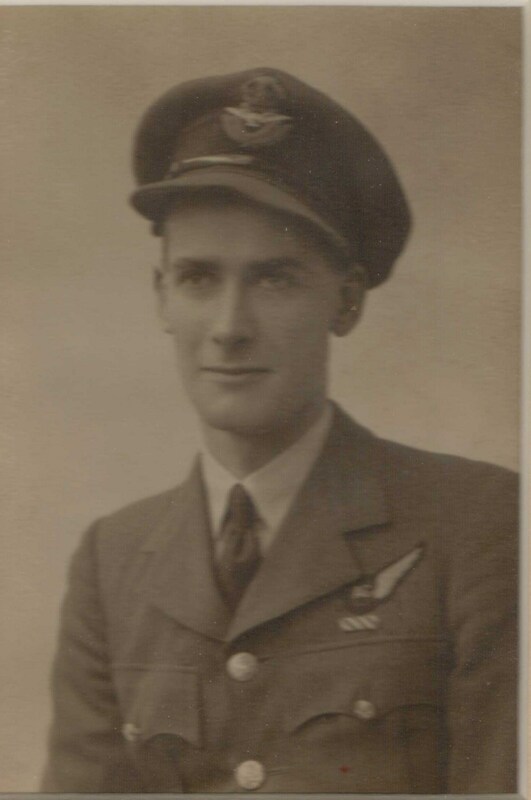 After training as an observer, he became a wireless operator/air gunner and served a full tour of 28 operations in the Whitleys of 51 Squadron, starting in September 1940. 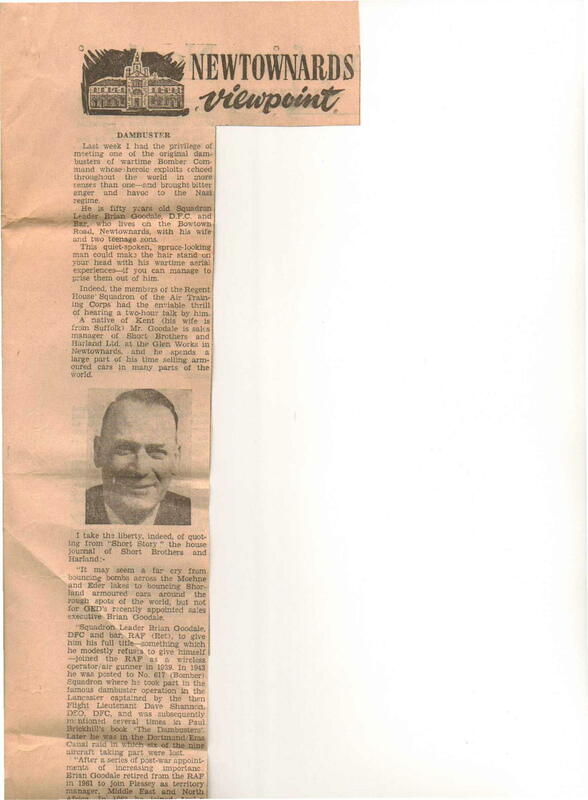 During this time, he received the DFC and was commissioned. Then, after a period instructing, he was summoned to Scampton to join 617 Squadron when the call came to find an experienced wireless operator for the Shannon crew. Some of the escapades in which Goodale were involved after the Dams Raid have passed into Squadron folklore. Prominent among them is the trip by train from Lincoln to London for the investiture at Buckingham Palace, where he had to be locked in a lavatory after a drunken trouser-removing incident. Fortunately, Adjutant Harry Humphries managed to retrieve them, crumpled and dusty, before anyone became too offended. Many of these incidents were recorded by Paul Brickhill in his 1951 book The Dam Busters – items which add to its period charm. Goodale became the squadron’s Signals Leader in September 1943 and carried on flying on operations with Shannon for another nine months until he was posted out to another training centre. He was awarded a bar to his DFC. He stayed in the RAF after the war and retired as a Squadron Leader in 1961. He then had a career in business, including five years working for the armaments manufacturers Short Brothers in Northern Ireland. Brian Goodale died in 1977 in Bury St Edmunds, and is buried in All Saints Church, Hawstead, Suffolk.